This is one of my favorite foldables. 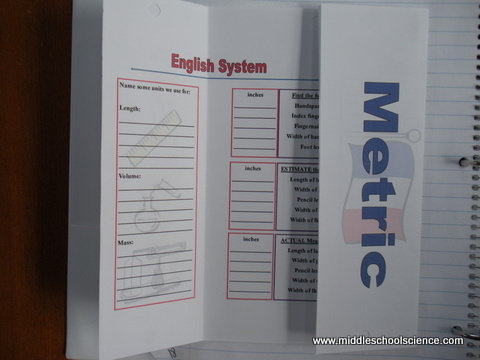 The notes for the metric system are a basic introduction with a series of short class activities. Brainstorming – with their lab group, students brainstorm all the different units we use to measure things, and classify each as length, volume, and mass. We then share and discuss our answers. Estimation – students estimate the sizes of common objects in a classroom using their hands and feet as rulers. They use a ruler to measure their hand span, fingernail width, etc. Once they have those measurements (and I take the rulers away), they estimate the sizes of different items in the classroom. After each group has made their estimations, we find the actual measurements and see how we did. Which group had the best estimations? Prefixes & Base Words – I introduce the base units for mass, volume and length: gram, Liter, and meter. We discuss the prefixes that can be added to the base units: kilo, centi, and milli. (I don’t really go into deci, deca, or hecto because they are not as commonly used.) Then I explain how you can mix and match the prefixes with the base units and the kids list all the combinations that are possible and we go over what each one means. We also practice writing and using the abbreviations. For example centi + meter = centimeter (cm) and its used to measure distance (length). Metric System Notes (pdf): It is best printed out on legal size paper, but in your printer settings, you can scale it down to 8 1/2 x 11. For more lessons on properties of matter, please visit my Properties of Matter Page.